mmsonline.com March 2017 MMS 145 MODERN EQUIPMENT REVIEW desktop PC, laptop or tablet. The software comes bundled as a complete kit with rugged carrying case, Bluetooth dongle loaded with PC analyzer software, digital load meter, and the traditional handheld pendant for manual diagnostics, testing and measurement. Once the user inputs the required data and commences a test, the software will compile a G-code program to run the test on the machine. Once the test has run and is completed, the software will then plot on the PC screen the actual gripping force of the machine at all spindle speeds the user entered. Kitagawa-NorthTech Inc., call 800-222-4138 or visit kitagawa.com. 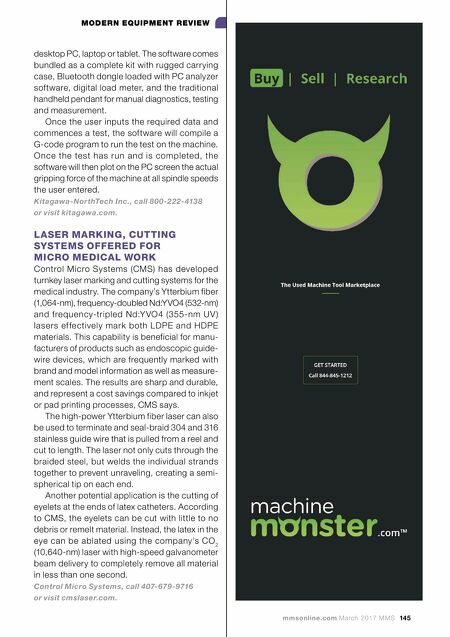 LASER MARKING, CUTTING SYSTEMS OFFERED FOR MICRO MEDICAL WORK Control Micro Systems (CMS) has developed turnkey laser marking and cutting systems for the medical industry. The company's Ytterbium fiber (1,064-nm), frequency-doubled Nd:YVO4 (532-nm) and frequency-tripled Nd:Y VO4 (355-nm UV ) lasers ef fectively mark both LDPE and HDPE materials. 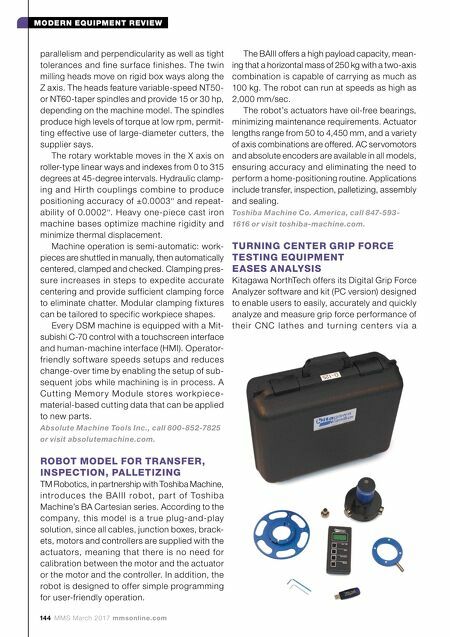 This capability is beneficial for manu- facturers of products such as endoscopic guide- wire devices, which are frequently marked with brand and model information as well as measure- ment scales. The results are sharp and durable, and represent a cost savings compared to inkjet or pad printing processes, CMS says. The high-power Ytterbium fiber laser can also be used to terminate and seal-braid 304 and 316 stainless guide wire that is pulled from a reel and cut to length. The laser not only cuts through the braided steel, but welds the individual strands together to prevent unraveling, creating a semi- spherical tip on each end. Another potential application is the cutting of eyelets at the ends of latex catheters. According to CMS, the eyelets can be cut with little to no debris or remelt material. Instead, the latex in the eye can be ablated using the company's CO 2 (10,640-nm) laser with high-speed galvanometer beam delivery to completely remove all material in less than one second. Control Micro Systems, call 407-679-9716 or visit cmslaser.com.